Across early modern Europe, the growing scientific practice of dissection prompted new and insightful ideas about the human body. This collection of essays explores the impact of anatomical knowledge on wider issues of learning and culture. 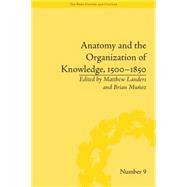 The contributors argue that the study of anatomy directly influenced the way in which emerging disciplines of study were organized.